That was me, as a little girl, anytime I heard my Aunt Ginny, Papa’s sister, was coming for a visit. She and her husband lived in Plant City, Florida, and would visit my grandparents a couple of times a year. They would always bring whatever was fresh at the time, either strawberries or oranges, but my favorite was Aunt Ginny’s strawberry jam. 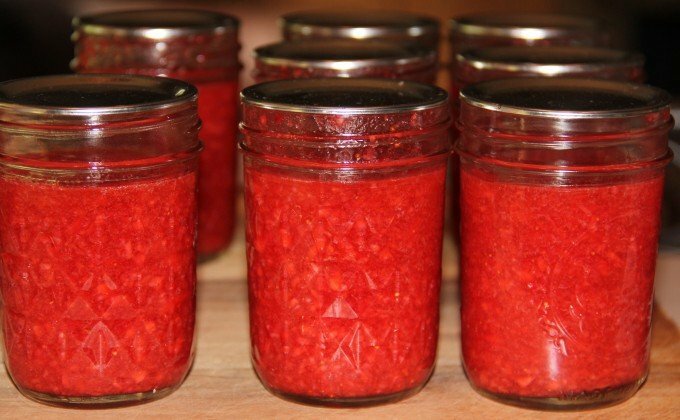 Aunt Ginny’s strawberry jam was different from everyone else’s. It tasted just like strawberries, but sweeter. Mama and Granny made jellies and preserves, but rarely strawberry because we didn’t have those for a while…at least until my grandfather started driving down to Plant City to get strawberry plants and strawberries. I thought the jam was a secret formula that only Aunt Ginny knew, and figured it was lost to me forever after she passed away. And then through family lore, I learned that it was just freezer jam and anyone could make it. Since then, I’ve experimented with Sure-Jell® and Ball® and decided I prefer the Ball recipe and pectin. It calls for less sugar so the strawberries taste fresher and lighter. Sure-Jell® offers a low-sugar version of their pectin as well, which is probably the same as the Ball® regular version, however I haven’t tried it so I can’t vouch for it. or in the food processor. I bought a container of Ball® instant pectin and followed the recipe exactly. 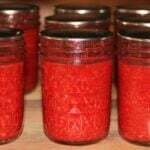 I made several batches six jars at a time as recommended by the directions. 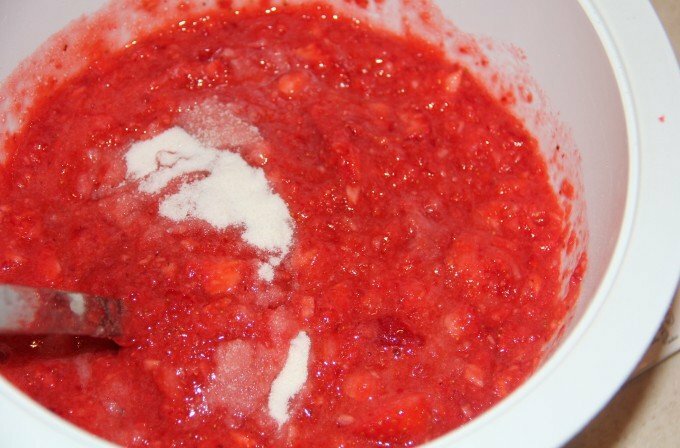 Using this method, stir 2 tablespoons of the pectin into 2/3 cups of sugar for every 2 jars of jam. Then add the fruit to the sugar mixture and stir for three minutes. Hint: use a liquid measuring cup to measure the fruit. I made six jars at a time, so I tripled the recipe accordingly. 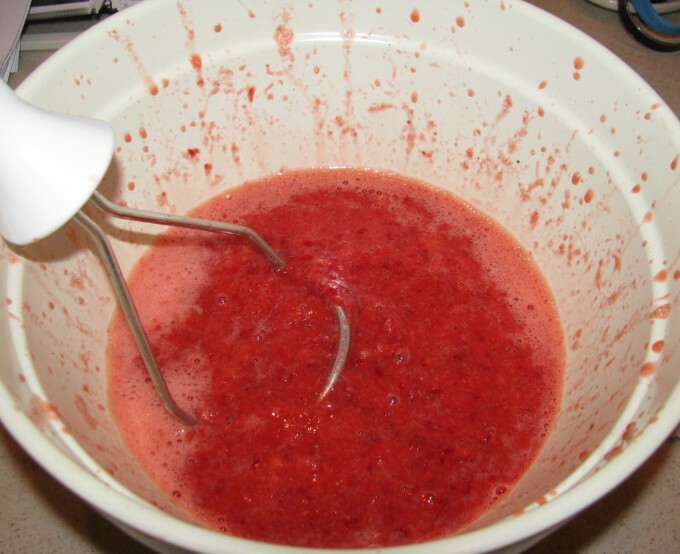 After stirring for about three minutes, ladle the jam into jars, leaving at least half an inch at the top. Let the jars sit out overnight of for 6-8 hours, then screw on the bands and place in freezer until ready to use. You can refrigerate any that you want to use immediately. And that’s it! Couldn’t be easier and the jam is delicious and tastes like fresh strawberries. 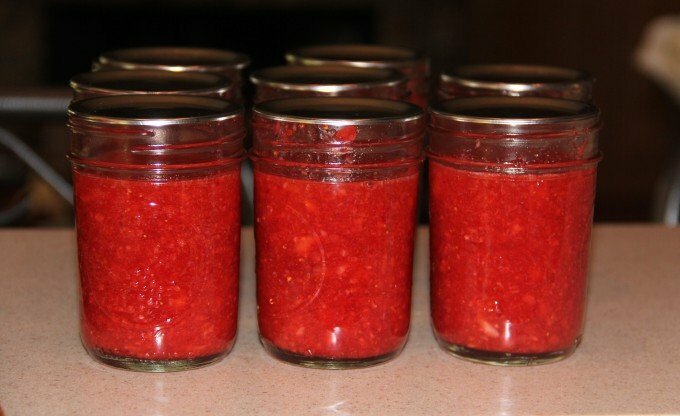 A summery strawberry jam with no cooking and no heat preservation. Goes straight into the freezer and tastes like fresh strawberries. Mash strawberries until just barely pureed. You want to leave bits of fruit. Stir together sugar and pectin. 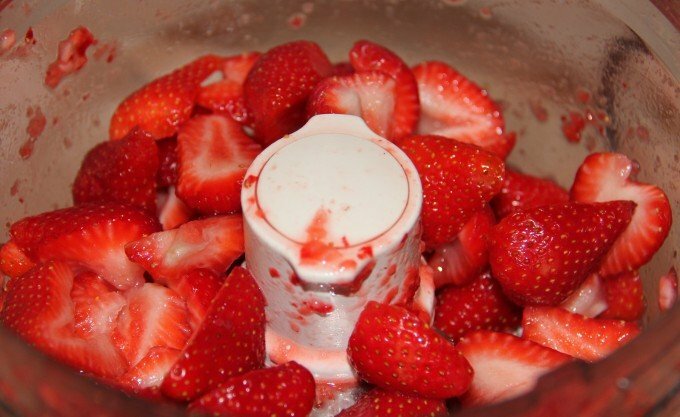 Mix strawberries into the sugar and stir for 3 minutes. Ladle jam into clean jars, leaving 1/2 inch space at the top. Let stand overnight or for 6-8 hours, then screw on the bands and place jars in freezer, or refrigerator if using immediately. I left my jam standing at room temperature overnight and then put in freezer the next day.